The Safeguard 1.8 oz Sunscreen with Carabiner features carabiner design for easy carrying and allows inserting company logo and message to Promote your Brand. Help your customers keep their skin protected against sunburn this summer with a unique gift that they would appreciate for sure. The Safeguard 1.8 oz Sunscreen with Carabiner is a great choice for promotional giveaway this season. It features SPF 30 sunscreen with a nice coconut scent to provide the perfect sun-protection cream to your valuable clients. The custom sunscreen is FDA approved and has a shelf life of two years. It comes with a carabiner for easy attachment to belt to bags. 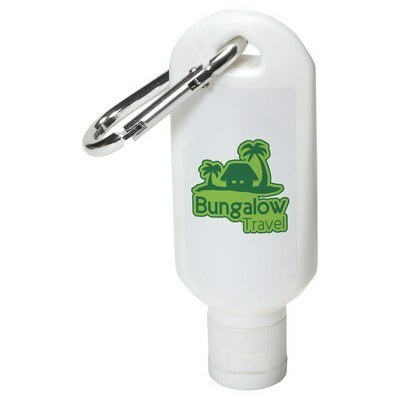 White colored sunscreen bottle makes sure that your logo gets noticed when you print it using the imprint methods available.